Frank McDonald’s Sioux City Sue repurposes the script from the 1939 comedy She Married a Cop and takes its title from one of the most popular songs of 1946. 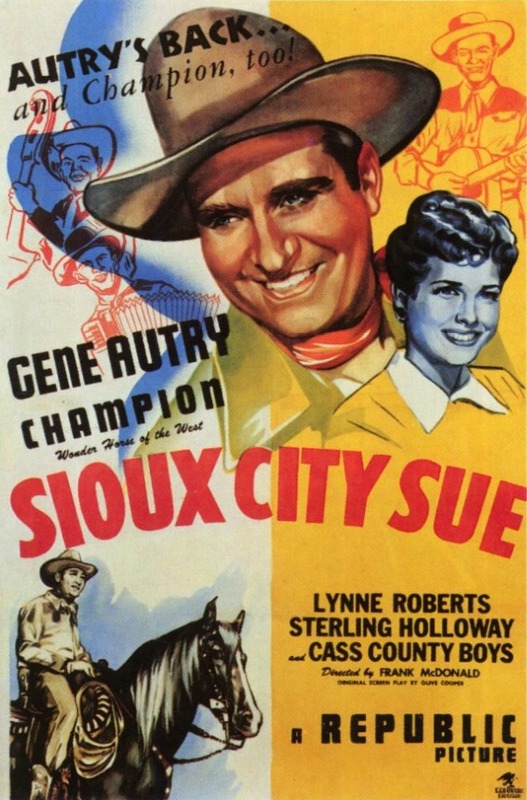 It was Gene Autry’s first film after he completed his service in the Army Air Corps during World War II. In a plot that makes no sense if you stop to think about it for longer than half a second, a pretty blond Hollywood talent scout named Sue Warner (Lynne Roberts) casts Autry in an upcoming movie without telling him that he’ll never actually appear onscreen and is in fact voicing a singing donkey in an animated feature. Things have changed a lot. Now, Hollywood stars regularly lend their voices to animated features. It’s nice work if you can get it; no time in the makeup chair, no difficult location shooting, and you can take your toddlers to the premiere. But in 1946, no star would ever dream of being in a cartoon. It’s hard, though, not to be delighted and amused by the premiere of the cartoon feature in Sioux City Sue. The little donkey with Autry’s voice, singing to his sweetheart on horseback, both of them wearing western duds, is pretty gosh-darned cute. But Autry’s been lied to, and that rightly doesn’t sit well with the man. Of course, during the making of the film, Sue fell in love with him, so the big question for the second half of the picture is whether or not she’ll be able to convince him she’s sorry. She does her darnedest, quitting her job and coming to work on his ranch as a cook and general menial laborer. This being a Republic western programmer, there’s an action-packed climax, and it’s up to Autry and his wonder horse Champion to save the day. The last few minutes of the picture, which involve a dynamited dam, a flood, and a cattle stampede, are exciting. But for the most part, Sioux City Sue is a laid-back and easygoing good time. Posted in 1946, November 1946 and tagged Armand Schaefer, Bert Dodson, Champion, Comedy, Edwin Mills, Forrest Burns, Frank Marlowe, Frank McDonald, Frankie Marvin, Fred Allen, Fred S. Martin, Gene Autry, George M. Carleton, Harold Miller, Harry Cheshire, Helen Wallace, James Conaty, Jerry Scoggins, Joseph Dubin, Ken Lundy, Kenne Duncan, LeRoy Mason, Lynne Roberts, Michael Hughes, Minerva Urecal, Musicals, Olive Cooper, Pierre Watkin, R. Dale Butts, Ralph Sanford, Reggie Lanning, Republic Pictures, Richard Lane, Sam Flint, Sioux City Sue, Sterling Holloway, Tex Terry, The Cass County Boys, Tommy Coats, Tristram Coffin, Westerns. Bookmark the permalink.